While the International Space Station was traveling more than 256 miles over Quebec, Canada, NASA astronauts Ricky Arnold and Drew Feustel, captured the Dragon spacecraft at 6:54 a.m. EDT using the space station’s Canadarm2 robotic arm. The Dragon lifted off on a SpaceX Falcon 9 rocket from Space Launch Complex 40 at Cape Canaveral Air Force Station in Florida Friday, June 29 with more than 5,900 pounds of research, equipment, cargo and supplies that will support dozens of investigations aboard the orbiting laboratory. Among the hardware flying to the space station is a spare Canadian-built Latching End Effector (LEE), the part used as the “hands” that grapple payloads and visiting cargo spaceships such as Dragon. 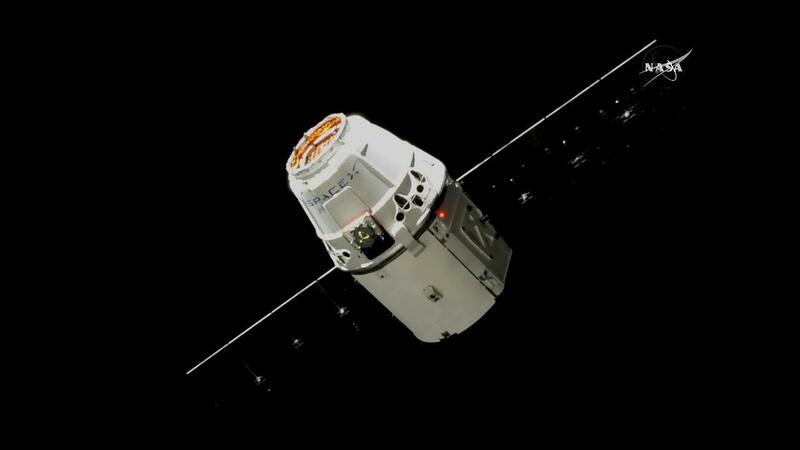 This was the 30th grapple of an arriving spacecraft, and the 15th time the Canadarm2 has captured a Dragon. Each end of the Canadarm2 robotic arm has an identical LEE, and they also enable Canadarm2 to “walk” to different locations on the orbiting outpost. Among the research arriving on Dragon is a cellular biology investigation (Micro-12) to understand how microgravity affects the growth, gene expression and ability of a model bacterium to transfer electrons through its cell membrane along the bacterial nanowires it produces. Such bacteria could be used in microbial fuel cells to make electricity from waste organic material.